Everyone buys food. The big question is, will we buy it prepared, partially prepared or fresh and waiting to be prepared? Other options include all that stuff crammed into the freezer…which probably includes frozen left-overs or something we bought for the sole purpose of giving a cooking break to the household chef. One of the prepared meals I have enjoyed is a frozen, fried rice entrée sold at Sam’s Club. This satisfying mixture pours out of a bag and stir-fries in minutes. The only down side to this meal is that it is not inexpensive. Today’s recipe replicates that comfort-food meal with a substantially lower cost, more wonderful ingredients and better flavors. 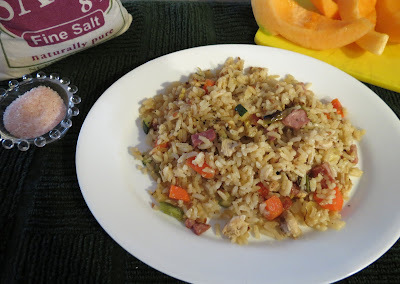 If more rice is added, Stir-fry Rice, Deluxe, can be stretched to feed several hungry people very economically. Another plus to this recipe is that it freezes well and can be made ahead, packaged by portion and saved for the next too-tired-to-cook day! 2 T (each), chopped vegetables: sweet onion, carrot, zucchini, celery. Optional vegetables: chopped green pepper, chopped red pepper, peas, soy beans, chopped water chestnuts, thinly sliced mushrooms. Heat a heavy pan to med. ; coat pan bottom with olive oil spray and scramble egg, breaking cooked egg into small pieces; remove to heated plate. Turn up heat to med-high. Add olive oil to coat pan bottom. Add chopped vegetables, season with pepper blend and stir until tender crisp; remove to a warm plate. Coat the pan bottom with more olive oil and add cooked rice. Stir rice to quickly heat through and brown slightly. Add soy sauce to taste and continue stirring until well blended. Add cooked ham, cooked chicken and bacon bits. Heat through. Add egg pieces and vegetables back to rice mixture in pan and gently toss to blend and heat evenly. (From the frozen: pour the desired amount of mixture onto a heated, griddle which has been coated with olive oil spray. Stir until heated through. Adjust seasonings if necessary. Serve).